Since the beginning of the 21st century the People’s Liberation Army Navy (PLAN) has steadily developed into a blue-water force able to rely on an ever increasing amount of modern equipment and platforms. This has been the result of years of intense effort on the part of naval planners in support of a more-forward oriented Chinese foreign and security policy. Indeed, until the 1990s, the PLAN was mostly a littoral or brown-water force tasked with protecting China’s waterways and never venturing far from coastal waters. Today the PLAN is enjoying an influx of money and new equipment as well as the fruition of development programs started in the 1990s and 2000s. All this has resulted in a professional force which is able to protect Chinese interest abroad, further Chinese foreign policy, and build Chinese prestige worldwide. This highlighted the main problem that the PLAN has faced since then, that is, it has limited ability to project power beyond its shores. Although during this period it was mostly due to technological and equipment deficits, geographically China is also disadvantaged. Even if it had managed to acquire blue water capability in the 1950s, China is surrounded by U.S. bases and allies checking its expansion. To an extent this also remains the problem today. Looking outward from China, one immediately realizes how precarious its geographical position is. Its economy depends on the manufacturing of goods and their export. China depends on oil imports to maintain its economic growth. All shipping movements have to pass through narrow straits and shipping lanes that can be easily cordoned off in case of war. Indeed, the whole of East Asia can be cordoned off through a series of islands that run from north to south, these include the Kuril Islands, the Japanese Archipelago, the Ryukyu Islands, Taiwan, the Northern Philippines, and Borneo; from the Kamchatka Peninsula to the Malay Peninsula. This is known as the first island chain3 and having control of the features and waterways of the chain effectively means control of access to both the China Seas and the Sea of Japan. Similarly, there is also the Second Island and the third island chains. The second island chain runs from Japan in the North, South towards Indonesia encompassing the North Mariana Islands, Guam, and Palau.4 The third island chain includes the Hawaiian Islands and runs through the mid-Pacific to New Zealand in the South. From Beijing’s perspective these island chains cut off China’s access to the high seas, keeping it isolated. Understandably, the Chinese are obsessed with these geographical features and their naval strategy is dictated by them. As its economy grew and became more dependent on sea trade, China set out to remedy its weakness at sea. For a traditional continental power like China, what Chinese admirals and generals see looking out from Beijing are concentric rings of American naval power stretching all the way across the Pacific (many would consider the U.S. West Coast as the fourth chain with Naval Base San Diego at its center). All these island chains are either directly occupied by the U.S. or by allies who give the U.S. access to ports and facilities. According to Liu, the PLAN should strive to develop four important capabilities: the ability to seize limited sea control in certain areas for a certain period of time, the ability to effectively defend China’s sea lanes, the ability to fight outside China’s claimed maritime areas, and the ability to implement a credible nuclear deterrent.7 To achieve this Liu suggested expanding the Navy and strongly advocated for the PLAN to acquire aircraft carriers. Huaqing outlined a three-step program for the PLAN. In the first phase, which was to be achieved by the year 2000, the PLA Navy needed to be able to exert control over the maritime territory within the First Island China, namely the Yellow Sea, East China Sea, and South China Sea. In the second phase, which has to be achieved by 2020, the navy’s control was to expand to the second island chain. In the third phase, to be achieved by 2050, the PLA Navy is to evolve into a true global navy.8 This is the broad outline of the PLAN’s strategy and since the 1980s it has been gradually acquiring the capabilities to carry it out. Today we are seeing the outcomes of this strategy. The PLAN has expanded rapidly, acquiring the capabilities for a true blue-water force able to protect Chinese interests abroad while Chinese foreign policy expanded concurrently. In the early 1950s most of the PLAN’s equipment was taken from the naval forces of the Republic of China as they retreated from the mainland. Officially the PLAN was established in September 1950, grouping together all the regional forces, some of which had defected, into a centralized command. The state of the PLAN was nothing to boast about. It was increasingly dependent on the Soviet Union to provide it with training and advisors, while home-built systems were basically none existent. As many as 2,500 Soviet naval advisers were deployed to China to boost the training of Chinese sailors while the Soviet Union also provided much of the PLAN’s equipment. Throughout the 1950s indigenous shipbuilding programs were instituted, shipyards were constructed, and Soviet-licensed designs were constructed without Soviet assistance. In 1958 when the Soviet Union refused to support the development of Chinese SSNs and SSBNs, the PLAN opened up the first institutes dedicated to the study of shipbuilding, naval weapon systems, underwater weapons, hydro acoustics, and other areas in a bid to remove its dependence on foreign designs. Expansion continued into the 1960s with the Chinese licensing more complex ship designs and weapons from the Soviet Union. By the mid-70s the PLAN could call upon a series of indigenous designs. In 1971 the Type 051 destroyer was commissioned. This was the first modern surface combatant to be designed and built in China, and the first Chinese ship to be fitted with an integrated combat system. This was followed by the commissioning of the Type 053 frigate and its various subclasses for air-defense, anti-surface, and export purposes. In 1974 the first indigenous designed nuclear submarine started service (the Type 091). Together with this a host of other smaller surface combatants, including gun boats and torpedo boats, also entered service. However, China had little interest in dominating the seas beyond defense. Its large border with the Soviet Union and the Sino-Soviet Split meant that China preferred to spend its resources guarding the border with the Soviet Union and Vietnam. The risk of a land invasion was perceived as a greater threat and took precedence over maritime power projection. Preoccupied with matters closer to home, the navy continued its training and expansion, competing for resources from other branches. In the 1980s naval construction fell below the levels of the 1970s. Up until that point the PLAN was still considered a regional naval power with green-water capabilities. Emphasis was placed on personnel development, reformulation of the traditional coastal defense doctrine, and force structure in favor of more blue-water operations; as well as training in naval combined-arms operations involving all elements of the PLAN (submarine, surface, naval aviation, and coastal defense forces). The PLAN also started to venture beyond coastal waters and into the Pacific. However the strong Soviet presence at Cam Ranh Bay kept most naval units tied down in defense of the coast. It also prevented more Chinese involvement in the various Sino-Vietnamese skirmishes. Spurred in part by the growth of the Chinese economy and the concentration of industry to coastal areas the Chinese increasingly looked at the sea as an economic lifeline. This was also the era when Liu came to prominence. 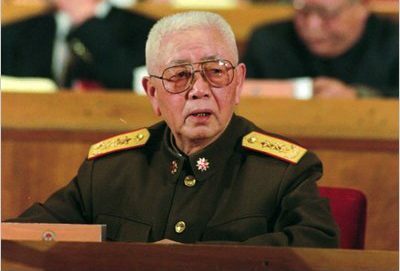 His friendship with Chinese leader Deng Xiaoping allowed him to influence the development of the PLAN. His programs included the reorganization of the navy, redeveloping the Marine Corps, upgrading bases and research and development facilities, and reforming the school system.10 These efforts can be considered as the origin of the professional navy that it is today. Despite these advances the PLAN was still largely subordinate to the People’s Liberation Army Ground Force until the 1990s. However, during this decade the PLAN continued with its modernization with the acquisition of more modern equipment from Russia and deployments to the Western hemisphere with visits to the U.S., Mexico, Peru, and Chile. The PLAN came into its own in the first decade of the 21st century. In terms of equipment the navy is increasingly relying on indigenous constructions. Today, of the entire surface force, only the 4 Russian Sovremenny-class destroyers and a number of Kilo and improved Kilo-class submarines are of foreign origin.11 The PLAN has also managed to acquire an ex-Soviet aircraft carrier from Ukraine which it has commissioned into service as the Liaoning. Whilst its combat capability is limited, it is being used as a testbed and indigenous designs are already under construction. A number of destroyers and frigates of indigenous design capable of blue-water operations are also in service. The Type 052 destroyers and the Type 054 frigates are all indigenous, proven designs which have been deployed in various operations worldwide. Effort has also gone into the creation of quieter indigenous SSBN. The PLAN has been more active worldwide since the first decade of the 21st century. It has been invited and attended RIMPAC in 201418 and 2016,19 and has again been invited in 2018.20 It trained with the Russian Navy during Joint Sea 2016 and 2017 military exercises, the later involving exercises in the Sea of Japan21 and the Baltic Sea.22 The fact that Chinese ships travelled to the Baltic is a testament to how far the PLAN has come. En route the flotilla of Chinese ships made various goodwill visits to Western ports. In this situation might has made right and China is certainly succeeding in getting its way in the South China Sea. Beyond the protection of trade this could also have other implications. Since the end of the Second World War the U.S. has been able to maintain a permanent presence in the region through a network of alliances and military bases. Under its hegemony the region has prospered economically. A powerful navy would allow China to challenge U.S. dominion in the region and usher in an era where China could be the hegemon in Asia, perhaps even envisioning its own version of the Monroe Doctrine. The modernization of the PLAN and the broadening of Chinese foreign policy are both linked. A larger, more advanced navy has allowed China to be more present on the world stage. Beyond prestige the PLAN has allowed China to be more engaged and aggressive in its foreign policy dealings. The need to maintain sea lines of communication has pushed China to further develop its navy. 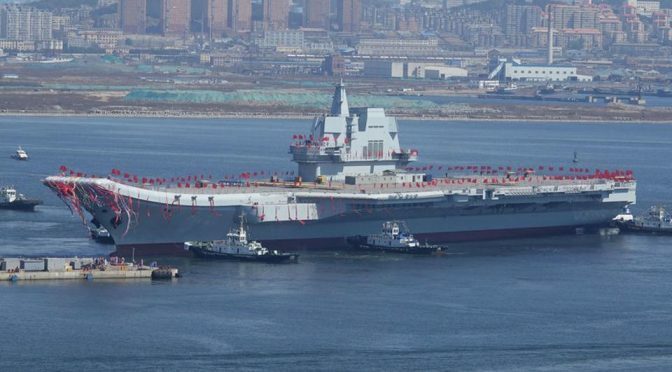 One can only speculate on what effect this will have in the long run; whilst some welcome a more present PLAN which can help secure the seas for all, there are those that reason that Beijing will increasingly use its newfound naval strength to expand its sphere of influence, creating an international or regional system that more suits its needs at the expense of others. After all, navies are the chief tool of global power projection and why build capability if not to use it? Steve Micallef graduated from the University of Malta with a B.A. (Hons) in International Relations in 2015. He also holds an MSc in Strategic Studies from the University of Aberdeen, Scotland. Cole, B. D. (2010). The Great Wall at sea: China’s Navy in the twenty-first century. Annapolis, MD: Naval Institute Press. 7. Yoshihara, T., & Holmes, J. R. (2013). Red star over the Pacific: China’s rise and the challenge to U.S. maritime strategy. Annapolis, MD: Naval Institute Press. 20. Cole, B. D. (2010). The Great Wall at sea: China’s Navy in the twenty-first century. Annapolis, MD: Naval Institute Press. 176. Zhao, Z., & Luo, Y. (2010). China’s national defense. China Intercontinental Press. 66-67. Zhao, Z., & Luo, Y. (2010). China’s national defense. China Intercontinental Press. 144-147. Kamphausen, R., Lai, D., Scobell, A., Army War College. Strategic Studies Institute, Bush School of Government & Public Service, National Bureau of Asian Research, . . . Texas A & M University. (2010). The PLA at home and abroad: Assessing the operational capabilities of China’s military. Strategic Studies Institute, U.S. Army War College. 296. Hayton, B. (2014). The South China Sea: the struggle for power in Asia. New Haven: Yale Univ. Press.61. Ha ha ha! UN anti piracy missions with Nuclear Submarines! Jokers! don’t even understand how to justify their naval deployments! China has to learn to share its space with the comity of nations or else it’ll be constrained where it wants to flex its muscle by the same powers who are being bullied by it! It’ll be matter of time before Vietnam & Philippines resisting Chinese deployments in the artificial islands made by China illegally!